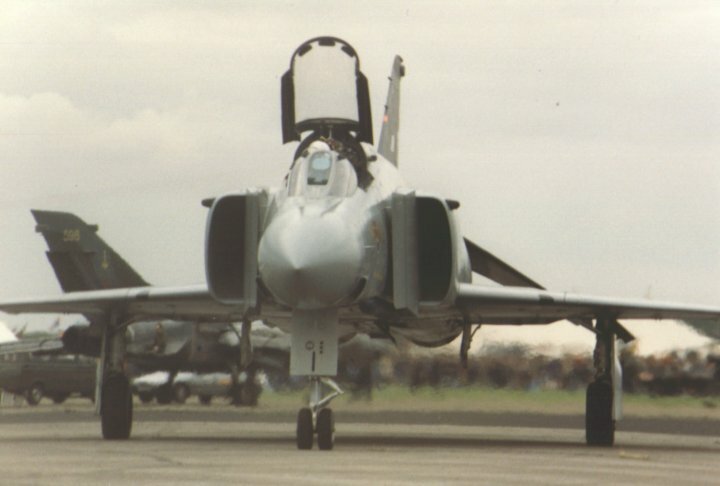 PHANTOM FG-1, FGR-2 & F-4J (UK) Aircraft Histories. XT595 YF-4K McDD, MoD(PE), Brough, Coningsby, St. Athan, scrap 9-81, nose RAFEF, 8550M, fuselage St. Athan, Wattisham, 8851M, fuse scrapped 6-93. XT596 YF-4K McDD, RR, RAE, BAe, preserved Yeovilton. XT598 Phantom FG.1 McDD, MoD(PE), E/ 111, Crashed 23-11-78. XT853 YF-4M BAe, 9071M, Scampton FS, scrapped 10-95. XT857 Phantom FG.1 McDD, RAE, A&AEE, 767, U/ PTF, C/ 111, dam ?-7-85, 8913M, MP/ Leuchars, scrapped 4-92. 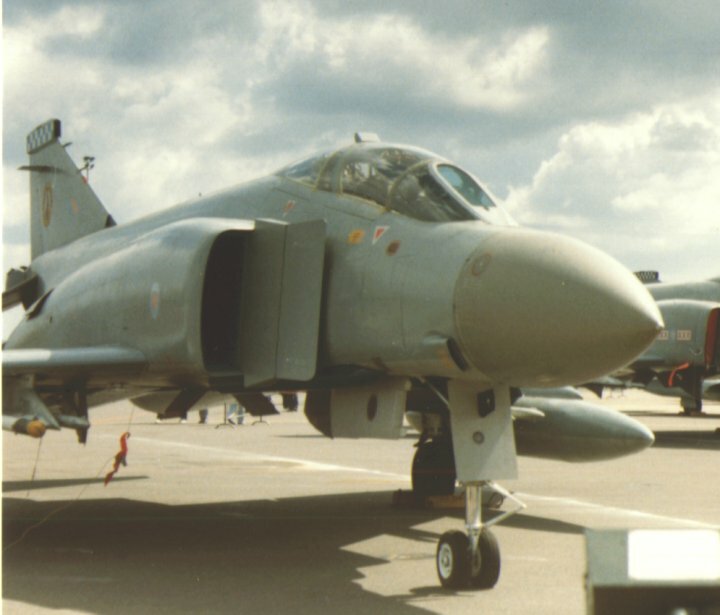 XT858 Phantom FG.1 RR, 724VL/ 700P, 001R/ 892, RAE, RR, RAE, BAe, Hucknall, Aldergrove, Leuchars, HoSM, Brough, Aston Down, Scrapped at Aston Down 1994. XT859 Phantom FG.1 725VL/ 700P, 001R/ 892, 155VL/ 767, 006R/ 892, HS, 006R/ 892, K/ 111, BK/ 111, 8999M, Leuchars, scrapped 4-92. XT860 Phantom FG.1 726VL/ 700P, 002R/ 892, 006R/ 892, PTF, L/ 43, AL/ 43, Crashed 20-4-88. XT861 Phantom FG.1 700P, 003R/ 892, 767, V/ PTF, C/ 43, Crashed 7-9-87. XT862 Phantom FG.1 722VL/ 700P, 004R/ 892, 015R/ 892, 156VL/ 767, Crashed 19-5-71. XT865 Phantom FG.1 A&AEE, 156VL/ 767, 892, RAE, 892, U/ 111, BU/ 111, Wattisham, scrapped 9-91. 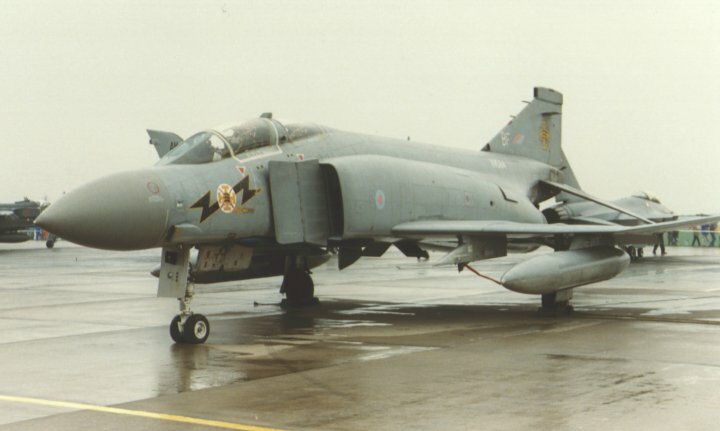 XT866 Phantom FG.1 158VL/ 767, HS, 158VL/ 767, 158LU/ 767, W/ PTF, O/ 43, Crashed 9-7-81, wreck Leuchars FS, hulk Faygate. 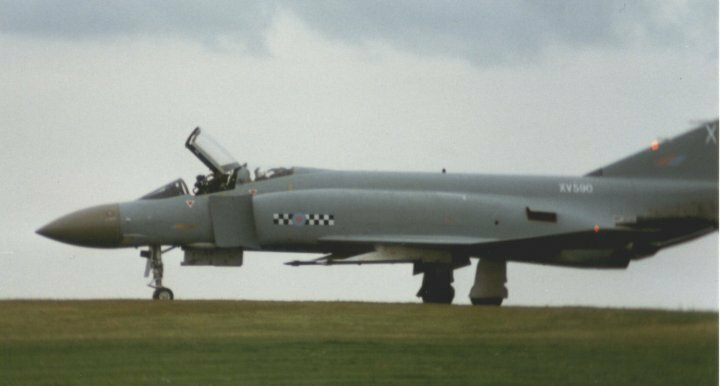 XT868 Phantom FG.1 153VL/ 767, 151VL/ 767, 000R/ 892, Crashed 12-5-78, wreck Leuchars FS. XT869 Phantom FG.1 700P, 154VL/ 767, 002R/ 892, Crashed 15-10-73. XT871 Phantom FG.1 007R/ 892, Crashed 25(or 17?)-7-73. XT872 Phantom FG.1 A&AEE, RAE, 007R/ 892, 001R/ 892, 004R/ 892, T/ 111, BT/ 111, Wattisham, scrapped 9-91. XT873 Phantom FG.1 767, A&AEE, S/ 43, A/ 111, BA/ 111, Leuchars, scrapped 4-92. 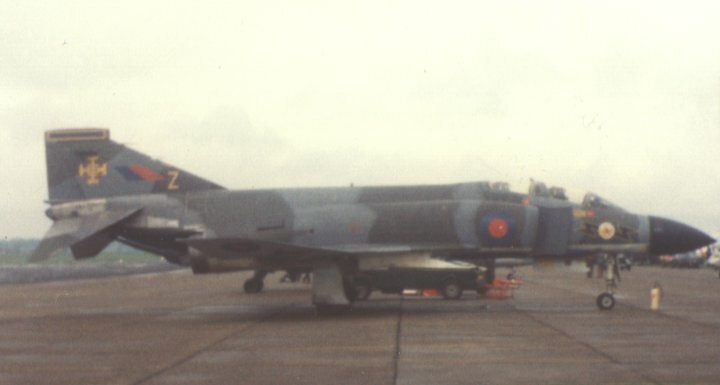 XT874 Phantom FG.1 J/ 43, E/ 111, BE/ 111, 9068M, Wattisham, Wattisham FS, Bruntingthorpe, scrapped 2-94. XT875 Phantom FG.1 157VL/ 767, K/ 43, AK/ 43, BP/ 111, Wattisham, scrapped 9-91. XT876 Phantom FG.1 160VL/ 767, Crashed 10-1-72. XT892 Phantom FGR.2 6, V/ 228OCU(64), V/ BAe, V/ 228OCU(64), X/ 56, CQ/ 228OCU(64), J/ 74, Wattisham, scrapped 4-93. 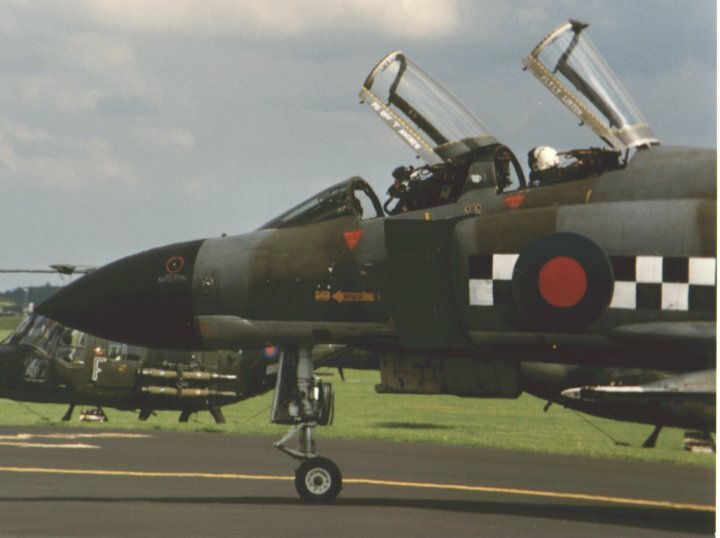 XT893 Phantom FGR.2 228OCU, K/ 111, Q/ 228OCU, Q/ BAe, Q/ 228OCU(64), CQ/228OCU(64), W/ 56, Crashed 24-4-89. XT894 Phantom FGR.2 B/ 228OCU, P/ 228OCU(64), P/ BAe, P/ 228OCU(64), CP/ 228OCU(64), X/ 56, Y/ 56, Wattisham, scrapped 9-92. XT895 Phantom FGR.2 228OCU, P/ 6, 228OCU, D/ 111, D/ 228OCU, T/ 92, H/ 228OCU(64), CH/ 228 OCU(64), CJ/ 228OCU(64), Q/ 74, Valley, 9171M, Valley FS, PEE Foulness. XT896 Phantom FGR.2 228OCU, P/ 6, 228OCU, K/ 19, A/ 228OCU(64), H/ 228OCU(64), B/ 228OCU(64), T/ 29, F/ 29, Y/ 228OCU(64), CY/ 228OCU(64), V/ 74, 27MU, scrapped 8-95. XT897 Phantom FGR.2 228OCU, C/ 228OCU(64), M/ 228OCU(64), Y/ 56, CC/ 228OCU(64), N/ 74, 27MU, scrapped 8-95. XT898 Phantom FGR.2 A&AEE, 228OCU, T/ 2, K/ 19, D/ 228OCU(64), T/ 29, E/ 228OCU(64), CE/ 228 OCU(64), St. Athan FS, scrapped 1993. XT900 Phantom FGR.2 228OCU, 14, 31, E/ 228OCU(64), O/ 228OCU(64), BAe, CO/ 228OCU(64), X/ 56, CO/ 228OCU(64), 9099M, Honington, Stock, scrapped 1995. XT901 Phantom FGR.2 228OCU, J/ 17, T/ 2, 228OCU(64), B/ 19, K/ 19, D/ 228OCU(64), Y/ 56, CR/ 228OCU(64), O/ 74, Wattisham, scrapped 9-91. XT902 Phantom FGR.2 N/ 54, K/ 54, F/ 228OCU(64), I/ 228OCU(64), M/ 29, X/ 56, CR/ 228OCU(64), K/ 19, Wattisham FS, scrapped 3-92. XT903 Phantom FGR.2 228OCU(64), 2, G/ 228OCU(64), X/ 23, R/ 228OCU(64), Y/ 92, CM/ 228OCU(64), X/ 56, Wattisham, Leuchars, Preserved RAF Museum Hendon. XT904 Phantom FGR.2 228OCU, Crashed 15-10-71. XT906 Phantom FGR.2 31, T/ 2, 228OCU(64), 17, 228OCU(64), T/ 29, S/ 228OCU(64), X/ 56, CH/ 228 OCU(64), W/ 56, Wattisham, scrapped 6-93. XT907 Phantom FGR.2 I/ 228OCU(64), T/ 228OCU(64), CT/ 228OCU(64), W/ 56, CP/ 228OCU(64), W/74, Wattisham, 9151M, Chattenden. XT908 Phantom FGR.2 P/ 6, 228OCU(64), P/ 6, P/ 23, Y/ 56, T/ 92, W/ 228OCU(64), AK/ 19, 92, CW/ 228OCU(64), Crashed 9-1-89. XT909 Phantom FGR.2 228OCU, 31, 228OCU(64), Y/ 56, 228OCU(64), T/ 23, K/ 228OCU(64), M/ 29, N/ 29, T/ 92, W/ 92, CS/ 228OCU(64), AK/ 19, CS/ 228OCU(64), A/ ?, Wattisham, scrapped 9-92. XT910 Phantom FGR.2 228OCU, T/ 2, 228OCU(64), P/ 29, I/ 228OCU(64), P/29, B/ 228OCU(64), J/ 228OCU(64), Z/ 56, J/ 228OCU(64), CJ/ 228OCU(64), Z/ 56, O/ ?, 27MU, scrapped 8-95. 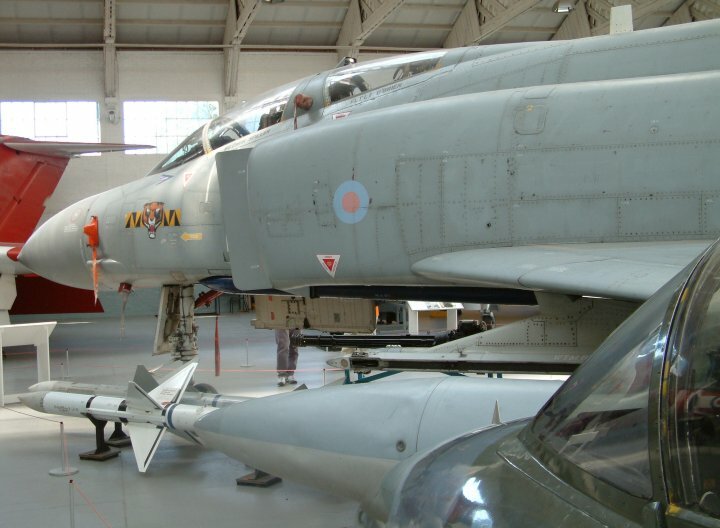 XT911 Phantom FGR.2 6, 228OCU, J/ 228OCU(64), K/ 19, T/ 92, St. Athan, scrapped 1993, nose Cardiff, Stock, scrapped 1995. XT912 Phantom FGR.2 14, K/ 111, K/ 23, F/ 29, L/ 228OCU(64), F/ 228OCU(64), Crashed 14-4-82. XT913 Phantom FGR.2 228OCU, Crashed 14-2-72. XV393 Phantom FGR.2 228OCU, 17, 31, Y/ 228OCU(64), A/ 228OCU(64), CA/ 228OCU(64), T/ 74, Q/ 74, Marham, scrapped 1994. XV394 Phantom FGR.2 228OCU, P/ 6, O/ 228OCU(64), C/ 228OCU(64), T/ 92, dam ?-?-90, Wildenrath, scrapped 9-91. XV396 Phantom FGR.2 228OCU, A/ 23, P/ 228OCU(64), H/ 19, N/ 228OCU, D/ 228OCU(64), CD/ 228OCU(64), Y/ 56, Wattisham, scrapped 9-91. XV397 Phantom FGR.2 31, 17, Crashed 1-6-73. XV398 Phantom FGR.2 228OCU, 17, K/ 228OCU(64), H/ 228OCU(64), I/ 228OCU(64), CI/ 228 OCU(64), CI/ 19, 74, Wattisham, scrapped 6-93. XV399 Phantom FGR.2 228OCU, 31, P/ 6, 14, 228OCU(64), 2, 41, X/ 29, P/ 29, N/ 228OCU(64), L/ 56, St. Athan, scrapped 9-92, nose Stock. XV400 Phantom FGR.2 R/ 6, C/ 54, 228OCU, F/ 41, X/ 29, 41, I/ 29, F/ 19, D/ 56, Wattisham, scrapped 9-91. XV401 Phantom FGR.2 228OCU, A/ 41, I/ 41, U/ 111, N/ 56, V/ 56, B/ 228OCU(64), L/ 29, A/ 23, 56, AA/ 19, CN/228OCU(64), I/ 74, Wattisham, Boscombe Down. 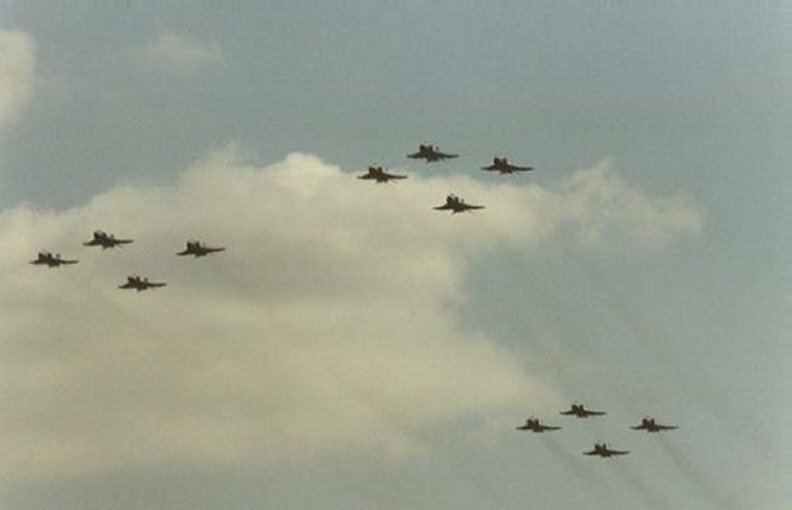 Boscombe Down Museum Sept 2000. XV403 Phantom FGR.2 6, A/ 54, A/ 111, T/ 23, M/ 111, Crashed 4-8-78. XV404 Phantom FGR.2 228OCU, J/ 54, J/ 111, 31, R/ 228OCU(64), H/ 23, B/ 56, E/ 29, I/ 19, Boscombe Down, Stock, scrapped 4-94. XV405 Phantom FGR.2 228OCU, Crashed 24-11-75. XV410 Phantom FGR.2 A&AEE, E/ 111, BAe, H/ 56, C/ 228OCU(64), E/ 23, E/ 56, Wattisham, scrapped 9-92. XV411 Phantom FGR.2 14, H/ 2, S/ 92, M/ 19, Q/ 92, BAe, O/ 56, O/ 29, O/ 56, G/ 19, L/ 19, 9103M, FSCTE Manston, 10-2-2010. XV412 Phantom FGR.2 A/ 54, B/ 41, I/ 41, 228OCU(64), X/ 92, J/ 19, W/ 92, D/ 29, F/ 56, H/ 29, S/ 29, P/ 92, Laarbruch. XV413 Phantom FGR.2 B/ 6, 14, E/ 2, 41, 2, Z/ 92, 228OCU(64), D/ 29, Crashed 12-11-80. XV414 Phantom FGR.2 B/ 54, B/ 111, N/ 41, F/ 111, P/ 92, B/ 23, R/ 23, Crashed 9-12-80, wreck Wattisham, scrapped 1992. XV416 Phantom FGR.2 C/ 54, H/ 54, H/ 111, Crashed 3-3-75. XV418 Phantom FGR.2 F/ 6, C/ 41, C/ 29, Y/ 92, D/ 19, 92, Crashed 11-7-80. XV419 Phantom FGR.2 228OCU, G/ 54, N/ 54, 14, J/ 111, 228OCU(64), G/ 29, G/ 23, BAe, CD/ 228OCU(64), A/ 23, A/ 1435 Flt, C/ 228OCU(64), AA/ 19 Sqn Wattisham, scrapped 6-93. XV421 Phantom FGR.2 14, B/ 23, P/ 228OCU(64), B/ 29, Q/ 29, B/ 228OCU(64), AN/ 92, D/ 19, F/ 1435 Flt, Crashed 30-10-91. XV422 Phantom FGR.2 E/ 6, 31, C/ 23, O/ 92, BAe, J/ 19, Y/ 92, C/ 19, T/ 56, 9157M, Preserved Stornaway, scrapped at Stornoway Oct 1998. XV424 Phantom FGR.2 H/ 6, E/ 54, B/ 6, 228OCU(64), B/ 29, B/ 111, D/ 56, Alcock & Brown, 56, M/ 228OCU(64), I/29, G/ 228OCU(64), W/ 92, W/ 29, CN/ 228OCU(64), Q/ 56, I/ 56, 9152M, Preserved Hendon. XV425 Phantom FGR.2 6, 228OCU, 14, 17, R/ 29, D/ 23, D/ 56, A/ 56, CD/ 228OCU(64), 9094M, Bruggen. XV427 Phantom FGR.2 31, 17, Crashed 22-8-73. 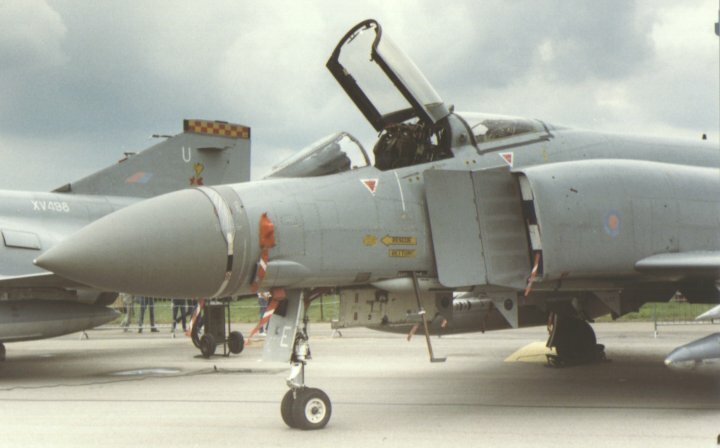 XV428 Phantom FGR.2 228OCU, 17, H/ 111, U/ 111, E/ 19, I/ 56, 29, CC/ 228OCU(64), Crashed 23-9-88. XV429 Phantom FGR.2 228OCU, 6, E/ 54, E/ 111, 228OCU, BAe, T/ 29, K/ 29, BAe, K/ 56, BAe, O/ 56, Q/ 56, Wattisham, scrapped 9-91. XV430 Phantom FGR.2 S/ 2, R/ 2, 228OCU(64), O/ 23, S/ 228OCU(64), F/ 23, C/ 19, A/ 19, S/ 92, Wattisham FS, scrapped 3-92. XV431 Phantom FGR.2 31, Crashed 11-10-74. XV432 Phantom FGR.2 N/ 6, L/ 54, L/ 41, N/ 6, 228OCU(64), 14, 228OCU(64), D/ 23, T/ 111, D/ 23, 56, T/ 29, C/ 23, H/ 56, N/ 56, Wattisham FS, scrapped 3-92. XV433 Phantom FGR.2 31, 228OCU(64), 29, W/ 228OCU(64), X/ 29, F/ 228 OCU(64), I/ 29, F/ 56, B/ 23, B/ 1435 Flt, T/ 74, E/ 74, 27MU, scrapped 8-95. XV434 Phantom FGR.2 31, G/ 54, E/ 41, 228OCU(64), 14, J/ 23, V/ 92, F/ 19, G/ 56, J/ 29, Crashed 7-1-86. XV435 Phantom FGR.2 14, M/ 23, Y/ 228OCU(64), O/ 92, X/ 92, P/ 228OCU(64), P/ 92, R/ 92, Wattisham, Llanbedr FS. 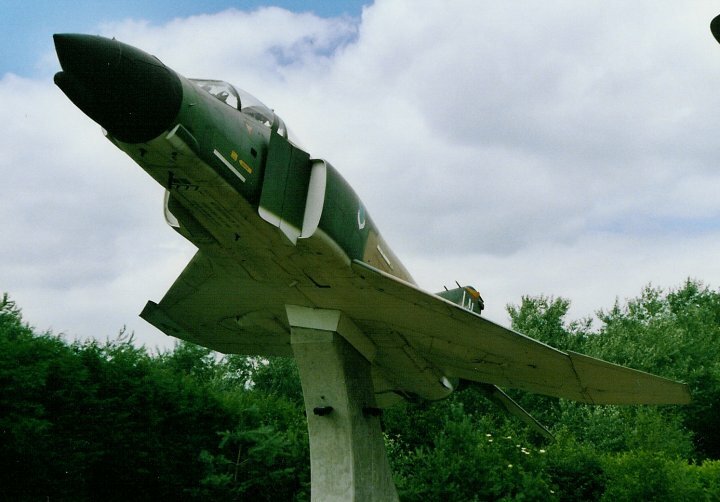 XV436 Phantom FGR.2 228OCU, B/ 111, 31, E/ 29, Crashed 5-3-80, wreck St. Athan, 8850M, scrapped 1-88. XV437 Phantom FGR.2 F/ 54, F/ 111, A/ 111, J/ 56, B/ 19, D/ 23, N/ 92, Y/ 92, Crashed 18-10-88. XV438 Phantom FGR.2 A/ 6, A/ 29, Y/ 228OCU(64), Y/ 29, 228OCU(64), C/ 23, C/ 1435 Flt, J/ 56, T/ 56, Wattisham, scrapped 9-92. 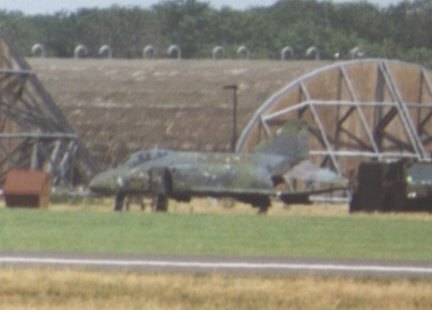 XV439 Phantom FGR.2 14, 2, A/ 19, D/ 19, X/ 92, Wattisham, scrapped 3-92. XV440 Phantom FGR.2 31, Crashed 25-6-73. XV441 Phantom FGR.2 Y/ 2, T/ 2, 14, Crashed 21-11-74. XV442 Phantom FGR.2 E/ 6, F/ 6, F/ 29, R/ 41, F/ 29, H/ 29, U/ 228OCU(64), R/ 29, 56, E/ 23, H/ 19, B/ 19, H/ 1435 Flt, Mount Pleasant. 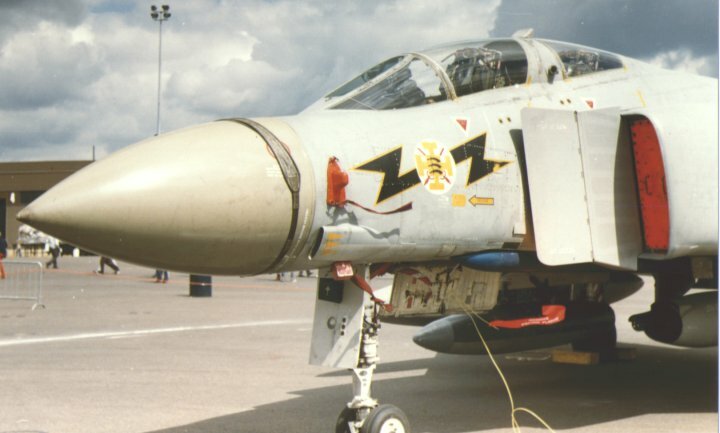 XV462 Phantom FGR.2 H/ 17, 31, 228OCU(64), T/ 41, Y/ 92, U/ 92, B/ 19, G/ 19, Crashed 8-1-91. XV463 Phantom FGR.2 14, R/ 41, Crashed 17-12-75. XV464 Phantom FGR.2 14, R/ 2, B/ 19, B/ 56, U/ 228OCU(64), U/ 29, U/ 23, J/ 23, J/ 29, N/ 56, AN/ 92, Wattisham FS, scrapped 3-92. XV466 Phantom FGR.2 228OCU, J/ 6, K/ 41, 14, 228OCU, U/ 92, K/ 56, E/ 29, E/ 23, CB/ 228OCU(64), R/ 56, D/ 1435 Flt, Mount Pleasant, scrapped 8-92. 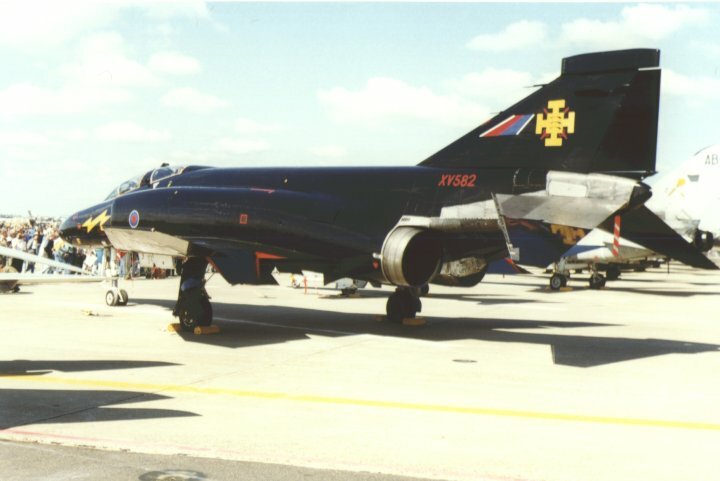 XV469 Phantom FGR.2 17, H/ 2, E/ 19, A/ 56, I/ 56, T/ 56, AO/ 92, B/ 56, N/ 74, 27MU, scrapped 8-95. XV470 Phantom FGR.2 H/ 2, W/ 2, 14, 17, C/ 56, V/ 92, W/ 228OCU(64), G/ 19, X/ 228OCU(64), CX/ 228OCU(64), AW/ 43, CX/ 228OCU(64), D/ 56, BD/ 56, Preserved Akrotiri, BDRT RAF Akrotiri 2000. XV471 Phantom FGR.2 17, T/ 41, 228OCU(64), 29, F/ 19, V/ 92, G/ 19, Crashed 3-7-86. XV472 Phantom FGR.2 228OCU, L/ 23, B/ 29, E/ 19, A/ 56, B/ 1435 Flt, F/ 1435 Flt, Mount Pleasant, scrapped 8-92. XV473 Phantom FGR.2 14, O/ 2, U/ 228OCU(64), L/ 29, 228OCU(64), L/ 29, E/ 29, K/ 56, N/ 56, Waddington, scrapped 5-93. 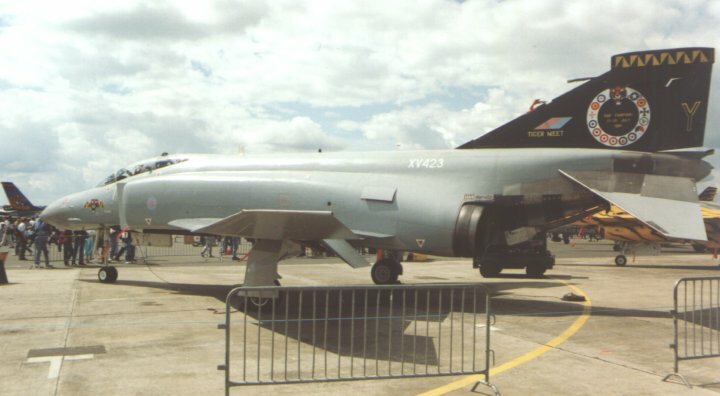 XV475 Phantom FGR.2 17, Y/ 2, H/ 56, C/ 19, P/ 92, S/ 92, Z/ 92, H/ 19, Bruggen. XV476 Phantom FGR.2 54, 31, B/ 111, S/ 23, S/ 56, L/ 19, V/ 92, G/ 19, S/ 56, Wattisham, scrapped 9-91. XV477 Phantom FGR.2 D/ 6, C/ 6, Crashed 21-11-72. XV478 Phantom FGR.2 D/ 41, O/ 54, O/ 111, 228OCU(64), 41, X/ 111, 228OCU(64), M/ 23, 111, J/ 29, Q/ 56, C/ 19, B/ 19, dam ?-4-90, Wildenrath, scrapped 1991. XV479 Phantom FGR.2 J/ 54, Crashed 12-10-71. XV480 Phantom FGR.2 M/ 6, J/ 41, 31, 111, D/ 56, B/ 56, Z/ 92, B/ 19, X/ 92, I/ 56, Wattisham, scrapped 9-91. XV481 Phantom FGR.2 H/ 6, E/ 6, E/ 29, J/ 19, G/ 19, H/ 19, F/ 23, X/ 92, H/ 56, Bruggen. XV482 Phantom FGR.2 K/ 54, E/ 41, L/ 54, L/ 6, L/ 29, C/ 56, Z/ 92, T/ 19, 9107M, Leuchars FS, scrapped 1995. XV483 Phantom FGR.2 31, 17, U/ 41, O/ 23, Y/ 92, Crashed 24-7-78. XV484 Phantom FGR.2 31, 14, F/ 23, G/ 19, H/ 23, C/ 29, C/ 23, Crashed 17-10-83. XV485 Phantom FGR.2 W/ 2, H/ 2, 14, K/ 29, X/ 228OCU(64), X/ 111, O/ 111, X/ 228OCU, P/ 23, W/ 228OCU(64), W/ 29, R/ 92, M/ 19, Burggen. XV486 Phantom FGR.2 14, I/ 2, 14, 31, T/ 111, E/ 56, J/ 56, F/ 56, B/ 23, Alcock & Brown, 228OCU(64), 29, X/ 228OCU(64), D/ 228OCU(64), N/ 29, St. Athan FS, scrapped 1993. XV487 Phantom FGR.2 31/ 17, L/ 29, Y/ 92, 23, K/ 56, C/ 29, Q/ 29, AA/ 19, B/ 56, G/ 74, 27MU, scrapped 8-95. 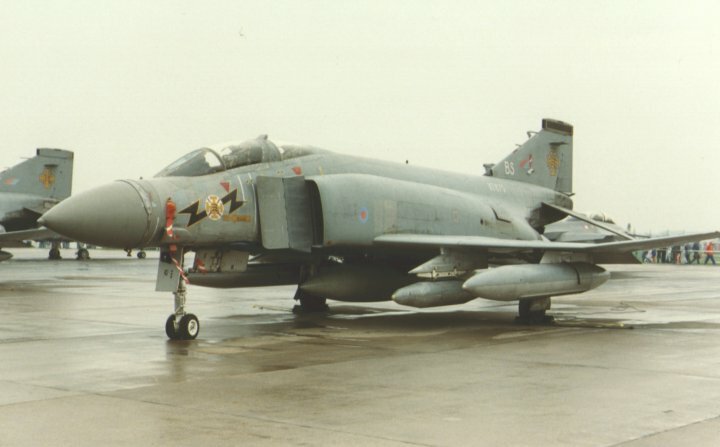 XV488 Phantom FGR.2 31, 17, I/ 2, H/ 19, U/ 92, R/ 228OCU(64), U/ 29, J/ 56, 228OCU(64), O/ 92, J/ 19, O/ 92, Wattisham FS, scrapped 9-92. XV489 Phantom FGR.2 O/ 2, 17, 31, F/ 56, V/ 92, A/ 29, A/ 56, G/ 23, CD/ 228OCU(64), AU/ 43, S/ 92, St. Athan, scrap 1992, nose PRG, To Holland 1997. XV491 Phantom FGR.2 31, O/ 111, L/ 19, I/ 19, F/ 29, Crashed 7-7-82. XV492 Phantom FGR.2 Q/ 6, Q/ 29, Y/ 41, U/ 228OCU(64), J/ 228OCU(64), U/ 23, U/ 56, 29, W/ 92, Wattisham FS, scrapped 3-92. XV493 Phantom FGR.2 228OCU, F/ 41, 41, Crashed 9-8-74. XV494 Phantom FGR.2 N/ 2, 17, 31, 228OCU(64), T/ 111, G/ 56, M/ 23, M/ 56, T/ 29, L/ 19, N/ 92, AN/ 92, O/ 19, Wattisham FS, scrapped 6-93. XV495 Phantom FGR.2 K/ 6, L/ 54, K/ 6, I/ 41, X/ 29, 228OCU(64), L/ 56, N/ 29, N/ 23, C/ 23, St. Athan FS, scrapped 1993. XV496 Phantom FGR.2 17, 228 OCU, G/ 41, 14, 17, H/ 23, W/ 92, J/ 19, L/ 19, V/ 92, A/ 56, Wattisham, scrapped 6-93. XV498 Phantom FGR.2 17, 228OCU, 17, E/2, J/19, R/92, N/92, U/92, L/19, U/92, Scrapped Wattisham, 3-92. XV500 Phantom FGR.2 M/ 54, M/ 111, H/ 56, K/ 23, S/ 23, B/ 29, J/ 56, 9113M, Preserved 'XV498' U/92 DARA St Athan Dec 2000. XV501 Phantom FGR.2 14, 31, W/ 92, O/ 29, T/ 56, B/ 56, 23, B/ 56, Crashed 2-8-88. 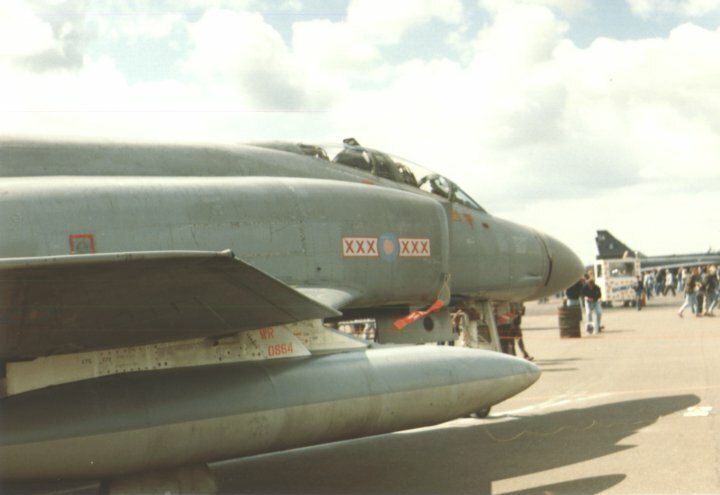 XV565 Phantom FG.1 001R/ 892, Crashed 29(or 28?)-6-71. XV566 Phantom FG.1 010R/ 892, Crashed 3-5-70. XV567 Phantom FG.1 A&AEE, 011R/ 892, 001R/ 892, RAE, 003R/ 892, I/ 43, AI/ 43, Leuchars, scrapped 4-92. 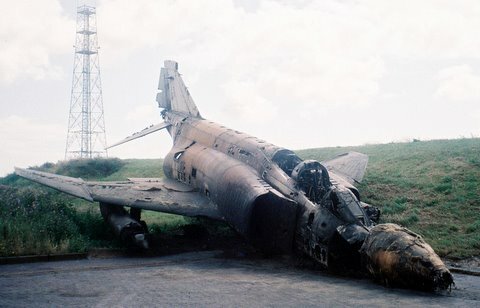 XV568 Phantom FG.1 012R/ 892, 002R/ 892, T/ 43, AT/ 43, Leuchars, scrapped 4-92. XV569 Phantom FG.1 767, 013R/ 892, X/ PTF, S/ 43, Q/ 111, BQ/ 111, 9063M, Wattisham, Wildenrath, Bruggen. XV570 Phantom FG.1 014R/ 892, Y/ PTF, N/ 111, BN/ 111, 9069M, Wattisham, scrapped 9-92. XV571 Phantom FG.1 A/ 43, AA/ 43, A/ 111, Leuchars, scrapped 3-92. XV572 Phantom FG.1 156VL/ 767, C/ 43, N/ 43, AN/ 43, BG/ 111, Leuchars, scrapped 4-92. 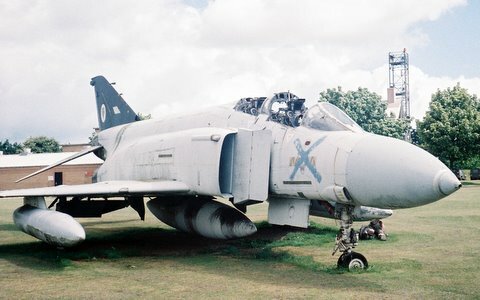 XV573 Phantom FG.1 L/ 43, C/ 43, L/ 43, D/ 111, BD/ 111, Leuchars, scrapped 1992. XV574 Phantom FG.1 B/ 43, Z/ 111, Wattisham, scrapped 9-91. XV575 Phantom FG.1 C/ 43, G/ 111, S/ 43, BO/ 111, Wattisham, scrapped 9-91. XV576 Phantom FG.1 D/ 43, AD/ 43, BK/ 111, Wattisham, scrapped 9-91. 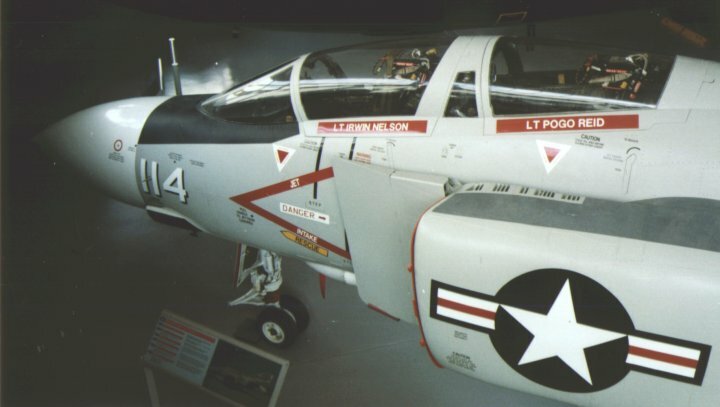 XV578 Phantom FG.1 O/ 43, F/ 111, Crashed 28-2-79. 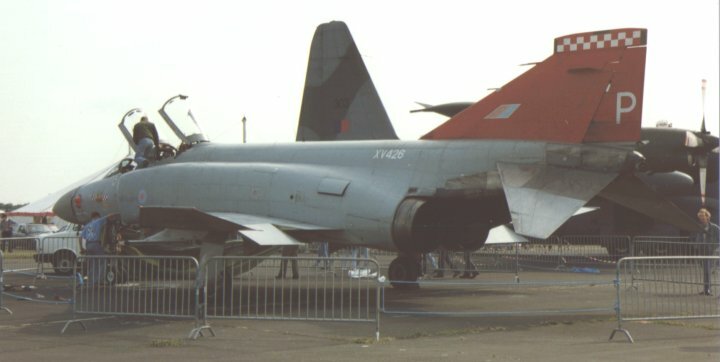 XV579 Phantom FG.1 157 VL/ 767, R/ 43, AR/ 43, Leuchars, scrapped 4-92. XV580 Phantom FG.1 Q/ 43, Crashed 18-9-75. 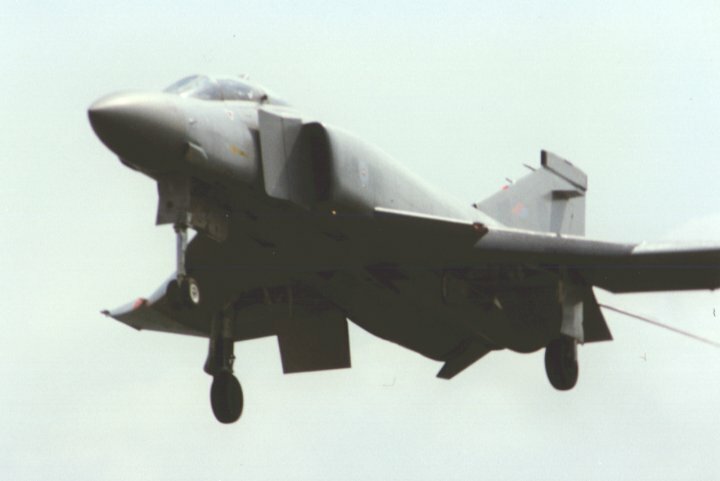 XV581 Phantom FG.1 E/ 43, AE/ 43, 9070M, Wattisham, Preserved Buchan, ATC Sqn Bridge of Don Feb 2000. Aberdeen Wing ATC 5th Jan 2002 (Cockpit Section). XV583 Phantom FG.1 G/ 43, B/ 111, BB/ 111, Wattisham, scrapped 9-91. XV584 Phantom FG.1 I/ 43, F/ 111, BF/ 111, Wattisham, scrapped 9-91. 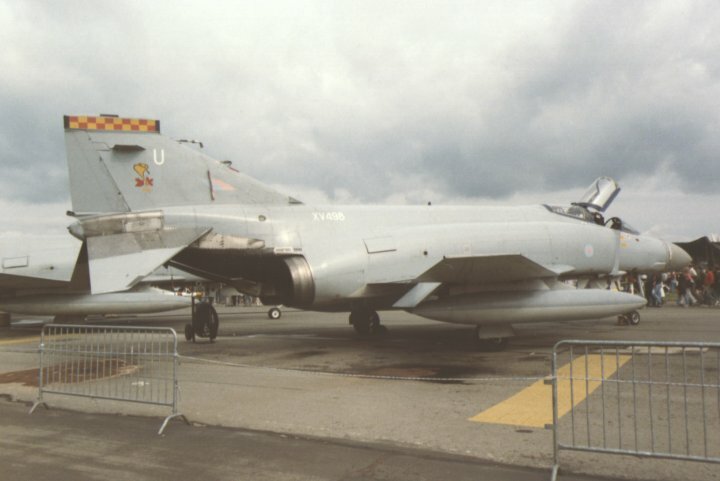 XV585 Phantom FG.1 F/ 43, H/ 43, P/ 43, AP/ 43, Leuchars, scrapped 1995. XV587 Phantom FG.1 013R/ 892, 010R/ 892, 009R/ 892, G/ 43, AG/ 43, BR/ 111, 9088M, Wattisham, scrapped 4-93. XV588 Phantom FG.1 010R/ 892, 004R/ 892, dam 18-5-77, LoS, fuselage Leuchars FS, nose Predannack, Culdrose FS, perished 7-96. XV589 Phantom FG.1 154VL/ 767, 006R/ 892, 011/ 892, P/ 111, Crashed 3-6-80, wreck Coningsby FS, scrapped 1982. 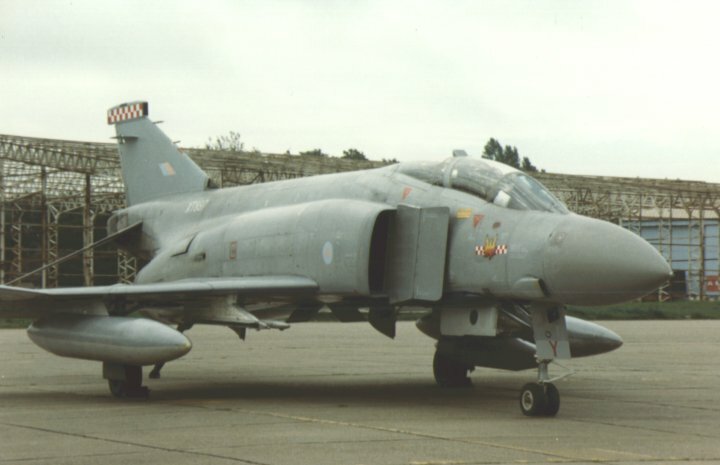 XV590 Phantom FG.1 001R/ 892, X/ 43, AX/ 43, Leuchars, scrapped 4-92. XV592 Phantom FG.1 004/ 892, 005/ 892, 008/ 892, X/ 111, L/ 111, BL/ 111, Wattisham, scrapped 9-91. ZE351 F-4J (UK) ex 153773, I/ 74, 9058M, Finningley, scrapped 11-95. 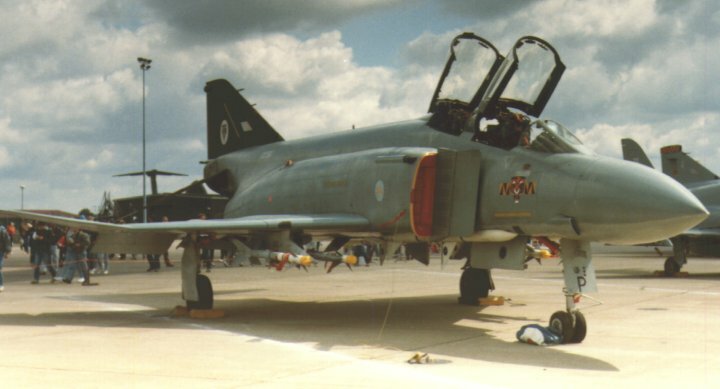 ZE358 F-4J (UK) ex 155510, H/ 74, Crashed 26-8-87. 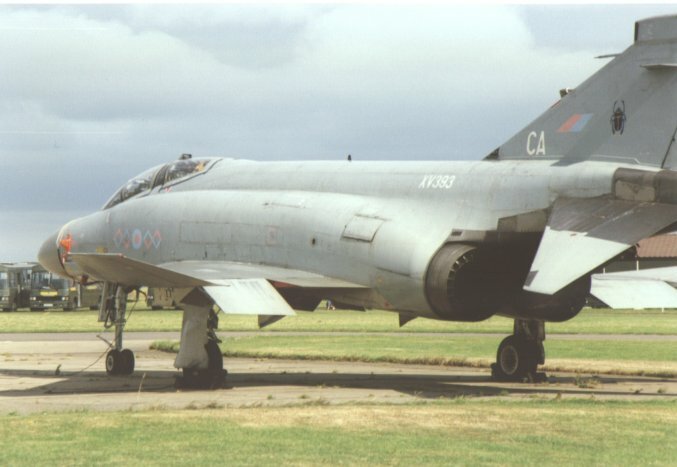 ZE364 F-4J (UK) ex 155894, Z/ 74, 9085M, Coltishall, scrapped 1996. British Based Non RAF/RN PHANTOMS. Thanx To The BFN for the data, and Doug J. Smith for info and pics. If Anyone has any updates on these Phantoms Please Email Me. Thanks.